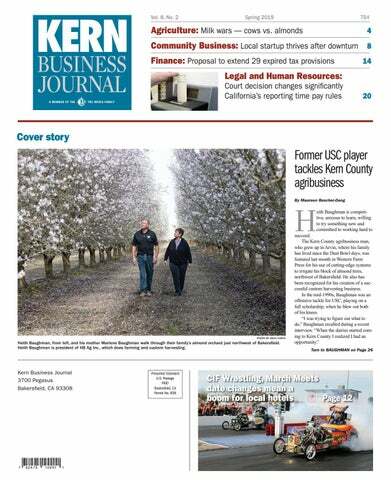 Kern County farmers and agricultural businesses have a unique tax incentive opportunity under the Tax Cuts and Jobs Act. The 2017 tax reform law includes the Qualified Opportunity Zone program, which offers capital gain tax deferrals for qualifying investments in designated low-income communities. Kern County has several zones that qualify for the QOZ program, which could result in significant tax savings for interested investors. The QOZ program permits taxpayers to defer a portion of the capital gains tax on an investment that is sold or exchanged and then reinvested into a Qualified Opportunity Fund that invests in a qualifying business in a designated QOZ. The QO Fund is typically a corporation or partnership designed to invest in QOZ property. Almost any type of investment is eligible to be invested into a QO Fund. There is also no minimum investment amount to take advantage of the program, but the investment, the fund and the property must meet strict parameters in order for the taxpayer to realize the capital gains tax benefit. First, investors must reinvest the capital gains proceeds from the initial investment sale into the QO Fund within 180 days of the initial sale or exchange of the investment. The QO Fund must invest a minimum of 90 percent of its funds into a QOZ property. QOZ stock and partnership interest qualify as QOZ property, as do direct investments into a QOZ business’s trade or business properties. Businesses are classified as QOZ businesses if substantially all of the business’s tangible property is TOB property that was purchased after Dec. 31, 2017. As an alternative to the original use requirement, the QO Fund or the underlying QOZ business qualifies for the program if it substantially improves the property and substantially all of the use of the property is in a QOZ. So long as the arrangement meets the program’s parameters, capital gains taxes are deferred. The deferral can last for as long as the taxpayer holds the qualifying investment or Dec. 31, 2026, whichever is earlier. There is no required holding period but the longer a taxpayer holds the QO Fund investment, the greater the tax deferral benefit. If taxpayers hold the investment for at least five years, they may qualify for a permanent tax exclusion of a portion of the gain. An even larger portion of the gain can be permanently excluded if the taxpayer holds the QO Fund investment for at least seven years. One of the most significant tax deferral opportunities arises if the taxpayer decides to hold the QO Fund investment for 10 years. During the sale of the investment that will be reinvested into a QO Fund, taxpayers can elect to have a basis in the QO Fund investment equal to its fair market value. The taxpayer could essentially permanently defer the gain on the sale, other than any gain recognized on Dec. 31, 2026, when the benefit expires. In its current form, the QOZ program is structured to reward those who invest early. A taxpayer who invests in a QO Fund on or before Dec. 31, 2018, who holds the investment for 10 years can exclude a portion of the preacquisition gain, while deferring the remaining preacquisition gain until Dec. 31, 2026, and exclude all of the post-acquisition gain after the investment date. To see a list of where the QOZs are located, visit www.cdfifund.gov/Pages/Opportunity-Zones.aspx. A qualified tax professional can also assist you with identifying and capitalizing on available QOZ opportunities. Steve Powers is a manager in the Bakersfield office of CBIZ and MHM. He specializes in tax consulting and preparation and financial analysis and consulting for agriculture companies. Steve can be reached at steven.powers@cbiz.com or 661-616-3751.